In the magical underworld of Victorian London, Tessa Gray has at last found safety with the Shadowhunters. But that safety proves fleeting when rogue forces in the Clave plot to see her protector, Charlotte, replaced as head of the Institute. If Charlotte loses her position, Tessa will be out on the street and easy prey for the mysterious Magister, who wants to use Tessa's powers for his own dark ends. With the help of the handsome, self-destructive Will and the fiercely devoted Jem, Tessa discovers that the Magister's war on the Shadowhunters is deeply personal. He blames them for a long-ago tragedy that shattered his life. To unravel the secrets of the past, the trio journeys from mist-shrouded Yorkshire to a manor house that holds untold horrors, from the slums of London to an enchanted ballroom where Tessa discovers that the truth of her parentage is more sinister than she had imagined. When they encounter a clockwork demon bearing a warning for Will, they realize that the Magister himself knows their every move and that one of their own has betrayed them. The summary of this book makes it sound absolutely awesome, doesn’t it? It seems like a magical mystical world full of sinister plots and horrors. The reality is not nearly as grand. The deeply personal war on the Shadowhunters? Turns out to be relatively tame and lame. The mist-shrouded manor? Not really that scary. The truth about Tessa? We do not actually find out. This book seems like it is going to be a page turner, but it falls short. 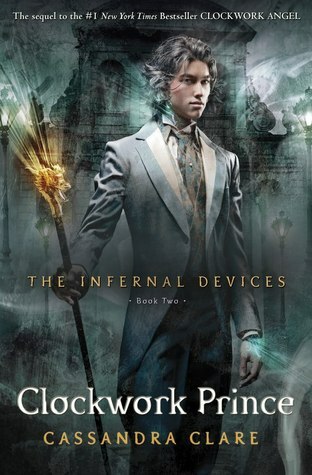 To be honest, I did not read the summary or the book jacket before beginning this second novel in the Infernal Devices series. I had absolutely no expectations, so perhaps it is unfair of me to say that this does not live up to expectations! It was fine. I read it. I will probably read the rest of the series whenever it shows up (there is quite a bit of a cliffhanger at the end, which finally felt to me like good juicy plotline). However, I just cannot really get engaged in the clockwork army or the scheming Underworld. I enjoyed the first book much more than this one, and it may have just been suffering from middle-child syndrome. It does build the story lines, I guess, but not much is actually revealed to us. When we find out why the Magister is so ticked off at the Nephilim, it seems a bit contrived. When we find out the role that the Lightwoods are playing in everything, it is a letdown. And, frankly, the clockwork army is just not frightening – they make me think of the robots from The Day The Earth Stood Still, not Megatron from Transformers. There were two other major things about Clockwork Prince that annoyed me. First of all, there is absolutely no recap of what happened in book one. So often in teen novels we have to suffer through a chapter of What Happened Last Time. I often grumble through those pages, but after not having them in this book, they were sorely missed! I honestly had no idea what was going on. Because several of the characters in this series are in her Mortal Instruments series as well, I was quite confused and could not remember what was supposed to be happening. Example – I was halfway through the book when I suddenly remember that Jem is Asian. Sure, it is not super integral to the story, but I could not even mentally picture what he was supposed to look like until that moment. For awhile, I thought Tessa was the one who could make new rune marks! The other part of Clockwork Prince that ticked me off (haha, ticked, clocks… nevermind…), was the faux-Victorian era. For the most part, you completely forget you are in Victorian Britain until a character randomly uses an old-fashioned phrase or brings up a corset and kid gloves. I feel like Clare has to keep forcing the setting. We get it, Tessa is “shocked” over her behavior with the boys in her life. How improper! But honestly, it is like putting a square peg into a round hole and left me wondering why the author insists again and again that these are “ye olde days” when it feels so unnatural. If you have to keep explaining to the audience over and over that Tessa cannot dress herself without her maid, and the audience continues to not care and forget, why bother in the first place? But, lest you think it is all bad, it isn’t. There are several surprises. We find out why Will is such a jerk all the time. We learn a bit more about Jessamine and the bug up her rear. Jem has quite a surprise in store at the end, as does Tessa. There is even a great scene between Charlotte and Henry that is encouraging to read. On the whole, I anticipate the next book to be much better than this one. If you are planning on continuing with the series (and I do still think it worthwhile), you will probably need to read Clockwork Prince to fill in some gaps. I think I will break this review down into positives and negatives. The negatives are pretty similar to what Ericka mentioned. I was incredibly confused getting back into this series. I knew the main characters- Tessa, Jem, and Will, but it had been a long time since I read Clockwork Angel and I was getting incredibly confused with characters in The Mortal Instruments series and this series. (It didn't help that many of them overlap). The story itself didn't progress a great deal as a whole- this did have a bit of a filler book to it. It DID have a great deal of emotional progress, but the action in the book had little to do with the Magister and more to do with the romance. Now though I did see some negatives, I really did love this book. I am a huge fan of Cassie Clare's. Even though it did feel like a filler book- it felt like a GOOD filler book. I couldn't put it down! The drama between Will, Jem, and Tessa was palpable! I really love the characters- they are incredibly likable and although the idea of a love triangle isn't original, it was incredibly fun to read. I enjoyed meeting new characters in this book (who will remain nameless for spoiler reasons). It was also fun to see names that related to her other series- I wish I had a flow chart to see who lined up with who. Clare does steampunk, and she does it well. I am really loving this series- even more than the Mortal Instruments, and I can't wait for more action and adventure in Clockwork Princess. Yes, I agree this books has some positive and negatives to it. I like it much better than TMI ! It's also a good read so, you can have your Jem or Will arguments. Jess and I were arguing over this as soon as I finished the book. I've got The Clockwork Prince on my TBR. I've got to admit, I really enjoyed getting the dual reviews. It's great to see the differing perspectives. I haven't read Clockwork Prince yet, because I continually hear that the ending has such a horrible cliffhanger and those have a tendency to tick (I get it Erika!) me off. And now hearing that it is mainly a GOOD filler, I think I may just wait until Clockwork Princess comes out to get back into this one. I am a HUGE fan of Cassie Clare and I think she is an amazing talent, but there are only so many cliffhangers this girl can handle and so far 5 of them are just about too many. Thanks so much for your reviews, both of you. It is nice to see 2 sets of opinions in the same place. It gives a greater impression of the book at hand. Sorry that I spelled your name wrong Ericka. I get it a lot and I know how aggravating it can be. ESPECIALLY when it is written right in front of your face. My apologies.